Systems Pharmacology and Toxicology is an emerging field which combines the principle of Pharmacology and Toxicology with Systems Biology. The field of Pharmacology and Toxicology aims to understand how therapeutic agents are absorbed, distributed, metabolized, and excreted (ADME) once administered into the organism and how such therapeutic agents exert their pharmacological and toxicological effects at their target sites. With the combination to the principles of Systems Biology, Systems Pharmacology and Toxicology provides a deeper understanding of the compounds’ effects ranged from the molecular levels up to the whole organism and allows to perform the scaling of drug concentrations from one organism to the others. The field of Systems Pharmacology and Toxicology offers a broad range of applications including quantitative and time-course predictions of drug responses, drug combination therapies, as well as drug toxicities in different types of organs based on clinical and molecular profiles. In Systems Pharmacology and Toxicology, mathematical models are commonly used to describe the processes of pharmacokinetics (PK) i.e what the body does to the drug and pharmacodynamics (PD) i.e what the drug does to the body. Once the classical PK/PD approach takes into account the prior information regarding the anatomy and the physiology of the whole organism the resulting model is called physiological-based pharmacokinetic/pharmacodynamic model (PBPK/PD). Such a model aims for a mechanistic understanding of the physiological processes that describe the drug’s ADME properties as well as the dose-response relationship within an organism in a quantitative and time-dependent manner. Nowadays, PBPK/PD models are viewed as a useful tool by the regulatory agencies at the lead optimization stage of drug discovery, at the selection stage of drug development (Zhuang and Lu Acta Pharm Sin b, 2016). Within the framework of the IMI-2 TransQST project, we work with academic and industrial partners to integrate various molecular models of cellular regulatory networks onto the PBPK/PD model. We aim to represent the PD part of the PBPK/PD models in a network-based format, either as logic-based models optimized to phosphor-proteomics data or as causal reasoning-based models inferred from gene expression data ( Liu, Trairatphisan, Gjerga et al BiorXiv, 2019 ). An alternative approach via the integration of quantitative measures from weighted gene co-expression analysis (WGCNA) into PBPK model is also being explored. The integrative PBPK/PD model is expected to provide new insights on the mechanisms of regulation of the PK/PD process from the molecular level towards the phenotypic outcomes in terms of drug toxicity. Our current interest is focused on depicting the pathophysiological mechanisms of drug-induced liver injury (DILI) and drug-induced kidney injury (DIKI), while the developed computational tools and analytical pipelines will also be applicable to the study of drug’s toxicological effects in other organs. 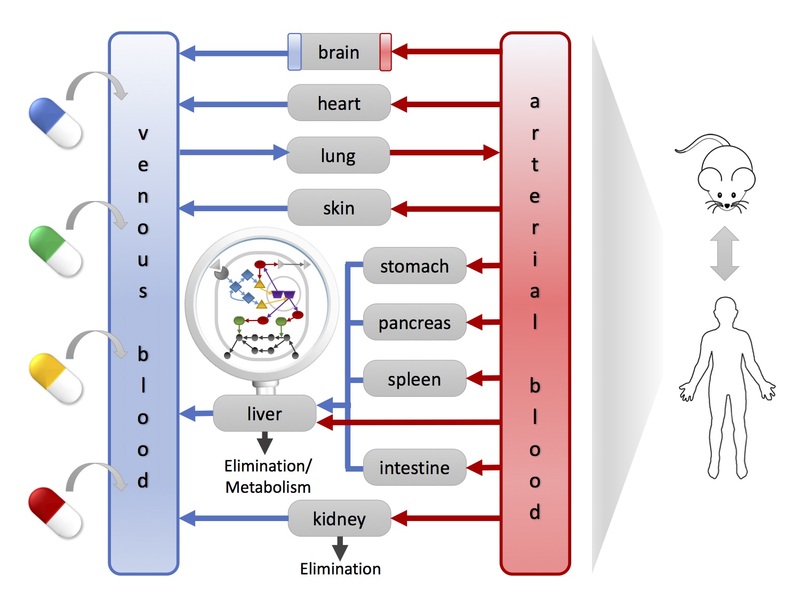 A physiological-based pharmacokinetic/pharmacodynamic (PBPK/PD) model comprises multiple organ compartments that represent the physiology of the whole organism. Such a model can be used to study the absorption, distribution, metabolism, and elimination (ADME) processes of administrative compounds (e.g. drugs) which link to molecular and phenotypic outcomes, and it can also be applied to extrapolate compounds’ concentrations between different organisms (e.g. between rodent species and human).